It's the 1st of the month, so it's time for the new releases from Doodle Pantry. As usual, Laurie has outdone herself. I actually created two cards for this release, so check out my other post below. For this card, I used the new set called Spooky Worms. Okay, okay...so they're not really all that spooky...but they are adorable, aren't they? I fell in love immediately and knew that I wanted to use both worms on one card. I started by printing one of the designer papers from the set onto white card stock. I layered this onto another piece of white card stock and then onto a black card stock base. I just two rectangles from purple and red card stock and angled them behind the image. I printed the outline image of both the mummy and dracula worms and colored them using Copic markers (mummy - C0, E11, E13; dracula - E11, E13, R02, R08, C4, C5, C9). I used the kiss technique using the Copic markers C5 and C9 to blend the darker grays a little better. The image was mounted onto black card stock and then layered onto the purple and red card stock. Using a font called Chiller, I typed the two sentiments into talk bubbles I found on Google Images and then hand cut the bubbles and popped them up above the worms using thin foam tape. Here is a preview of this set. Laurie has a 25% sale going on right now in the store. All of the new releases are already marked down, so you don't need a code to get them. Also, while you are making your purchase, don't forget to go to the Freebies page to pick up your free sets and/or your free with purchase sets. 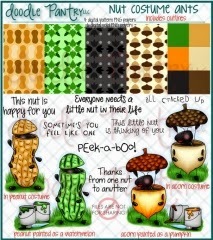 This month from October 1 - 24th, you can get the Nut Costume Ants set free with your purchase. Here's a preview of that set. 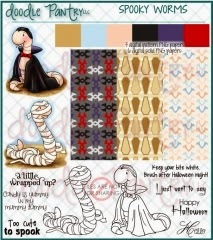 And don't forget to visit Doodle Pantry's Blog and enter the DPDC51 monthly challenge. The challenge runs each month from 12:00 p.m. on the 1st through the 24th. You can use any image you want to be eligible to win the $15 gift certificate. But, to be eligible to get the free stamp set, you must use a Doodle Pantry image (not just a sentiment). 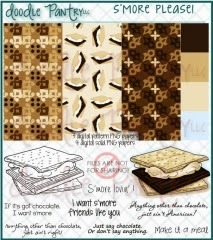 This month, all eligible entries will receive the S'more Please set just for entering with a Doodle Pantry image. Here's a preview of the set you will receive. Thank you so much for stopping by my blog. Please pop on over to see what the rest of the design team has made for you today. You can find a link to all of their blogs on the right hand side of this post. hehe! This card make me laugh. Love the sentiment and you great layout. Fun card, Susan! Love it! So cute and love your wonky layout too! LOL, so darn cute and love the sentiments! Thanks for joining us over at HIMCR for the challenge. lol I LOVE the costumes on the worms, sooo cute! Just way to funny love the sentiments. again Thank so much for joining us at Thought the Craft room Door challenge. You have used such a funny stamp for your card and colored it so beautifully! Love these colors. Thank you for joining us at Pile It On and don't forget to check on Wednesday, whether you are a lucky winner. Darling! Love that you used both worms on one card. Made me giggle! So funny! 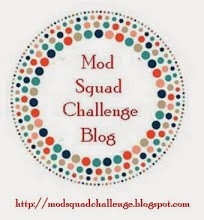 Thank you for joining us at 2 Cute Ink Challenge Blog. Hahah! This card rocks my socks off. So much fun!!!!!! !